The Coming Cataclysms. Relations between People. Revival of Humanity ! In the program release the following subjects are discussed: the importance of unification between people prior to the forthcoming events, particularities of relations between people in society and in family, causes and solution of conflicts; freedom of choice and mutual respect; exploration of oneself and observation of illusionary games of consciousness. Why is it impossible to perceive the spiritual world through consciousness? What is spiritual egoism? What is true Love? What does the paradox of life consist in? Particularities of human spiritual emergence, and how to focus attention on and live in the spiritual world. These and many other topics are addressed in The Truth is One for Everyone programme. The Truth is One for Everyone. Episode topic: The coming cataclysms. Relations between people. 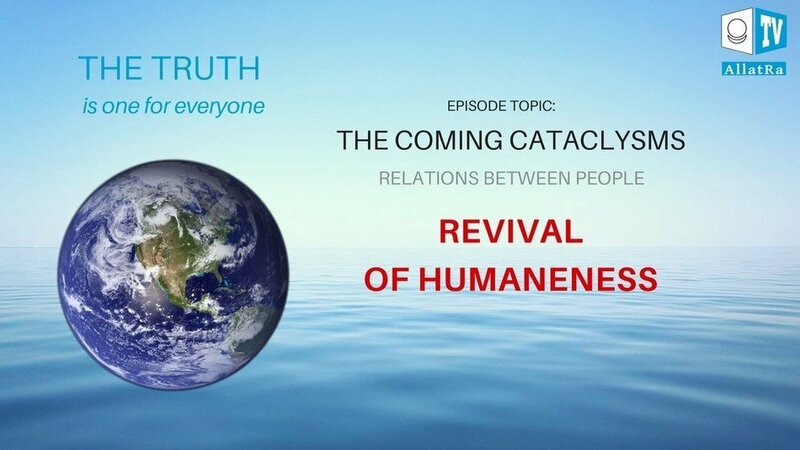 Revival of humaneness. In the program release the following subjects are discussed: the importance of unification between people prior to the forthcoming events, particularities of relations between people in society and in family, causes and solution of conflicts; freedom of choice and mutual respect; exploration of oneself and observation of illusionary games of consciousness. Why is it impossible to perceive the spiritual world through consciousness? What is spiritual egoism? What is true Love? What does the paradox of life consist in? Particularities of human spiritual emergence, and how to focus attention on and live in the spiritual world. These and many other topics are addressed in The Truth is One for Everyone programme. Keep up to date with all the latest news. We promise no spam! When replicating, copying and / or using fragments from the material, it is necessary to include a link to the original source - the website allatra-book.org - which contains the material in full.